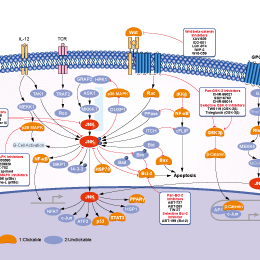 CC-930 is kinetically competitive with ATP in the JNK-dependent phosphorylation of the protein substrate c-Jun and potent against all isoforms of JNK (Ki(JNK1) = 44 ± 3 nM, IC50(JNK1) = 61 nM, Ki(JNK2) = 6.2 ± 0.6 nM, IC50(JNK2) = 5 nM, IC50(JNK3) = 5 nM) and selective against MAP kinases ERK1 and p38a with IC50 of 0.48 and 3.4 μM respectively. BI-78D3 is a competitive JNK inhibitor with IC50 of 280nM that displays > 100 fold selectivity over p38α and no activity at mTOR and PI-3K. (c) Immunostaining of Cx32, ALB, CPS1, CK18 and ECAD in hESC-Heps induced with SB or anisomycin.